I’d totally managed to miss True Swamp Neglect when I started doing LiveWire Live five years ago – they were just about stopping gigging as I was really starting in earnest. This reunion has been brought about by those members who’ve moved abroad coming back for a couple of weeks, so tonight is a chance to hear (with only a couple of rehearsals) what were at one time the second best band in Bournemouth, as tipped by BhOne’s Tone. A huge number of fans have obviously also taken the same opportunity as Champions is packed in the band area, and all those are going absolutely nuts with applause. The music is grungy in nature thanks to some good underlying continuous bass sustains. The lyrical melodies totally belie what is going on with the three guitars, which are sticking with the sustained chords for the most part. Then there are the groove moments, heavy with effects, this is definitely music with substance to be chilled to when listening. What I find interesting is that these guys get on and do the music without the theatrics and stage presence (save a shoe on the mic stand?!?) that many of todays generation of bands indulge in, and which I enjoy. Great all the same. A Saturday night with a bit of a difference – a fundraiser organised by Cranleigh Chapel on behalf of HopeFM, with a Chinese theme. A three course meal is served followed by some chinese themed entertainment – music and dance. There a a number of HopeFM listeners here, plus some presenters, and members of the chapel community. We also have the inevitable auction with an assortment of high value awards that have been donated. Pheonix arts troupe from Southampton are providing a range of entertainment for us, interspersed in the interludes between courses, and afterwards before, during and after the auction. The music and dance is a nice touch, courtesy of the Chinese church in Southampton. There are Peepah (the unique stringed instruments that are plucked and can also be fast-picked). Also featured are chinese violins, and an assortment of different styles of traditional dance. Finally the leader of the troupe Sings us a beautiful Chinese song, translated as The Road To Heaven. All very different from what I normally get to on a Saturday night, and all the more special as a result. 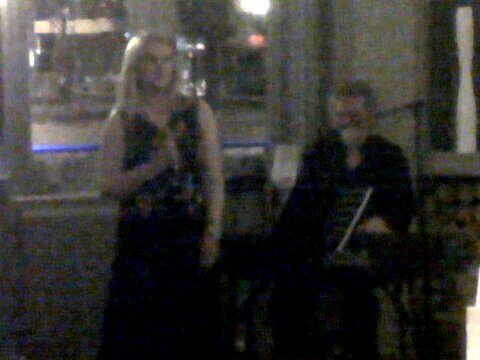 I’ve previously been tipped off about Misty Blue, admittedly by Lisa, one half of this Jazz Blues duo. 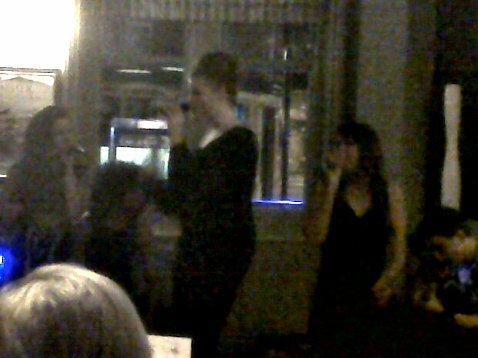 She’s singing Aretha Franklin, Ella Fitzgerald, Dusty Springfield and the like, accompanied by Bruce Griffin on piano. The title refers to the wonderful tone and mood they bring to The Richmond Arms, a new venue for me. Apologies for the processed photo – the Arms is a nicely decorated pub, but the lighting is dismal for my crapberry. Mr Griffin is wonderfully expressive on the keys, when called for half standing, swaying and providing added visual emphasis to keep pace with the music. I’ve not written about Lisa’s voice before, as I’ve not seen her since creating the blog; rich and mellow, perfectly in tune, able to reach deep with feeling, and high with passion, as called for by the score. I feel its a real privilege to just be able to walk in and hear them. After this it’s off to Chaplins for the final couple of numbers by Del Bishop – totally different, yet still engaging and enjoyable all the same.